By default, the author box is displayed on every post of your site. Just below post’s content. That’s what most users need. That’s what most users want. But, obviously, that might not be what you require. Conveniently, Molongui Authorship Plugin allows you to change that giving you the ability to control whether the author box should be displayed. And, if so, where it should be displayed. So you have several settings to control whether the author box is displayed or not. The ones provided by the free version of the plugin are pretty basic but enough for most. While the ones you have available in the Premium version provides you finer granularity to have full control on the author box display. All available settings to control displaying the author box are described below. Always keep in mind that, more specific settings prevail over not so specific settings. For instance, post setting overrides global plugin settings. Controlling whether to show the author box is pretty straight forward when using the free version of the plugin. There are just three options you need to pay attention to. First two can be found in the Display section, on the Author Box tab on the plugin’s settings page. The third one can be found in the post edit-screen. Show. Makes the author box to be shown on all posts and pages. Only On Posts. Makes the author box to be shown on all posts. This is the default value of the setting. Only On Pages. Makes the author box to be shown on all pages. Hide. The author box is not shown anywhere. Hide If No Author Biography. This global setting might override the ‘Default setting’ explained above when the author of the post has no bio to be displayed. Yes. The author box won’t be displayed. No matter the value of the ‘Default setting’. No. Author box being displayed will be controlled by the value of the ‘Default setting’. This is the default value of the setting. Show The Author Box In This Post? This post setting might override any of the global settings explained above. Show. The author box will be displayed regardless of ‘Default setting’ and ‘Hide if no bio’ settings’ configuration. Hide. The author box won’t be displayed. No matter how ‘Default setting’ and ‘Hide if no bio’ settings’ are configured. Default. This is the default value of this setting and, basically, has no effect on the author box display. Whether the author box is displayed will be decided based on the global display settings. Hide On These Post Categories. This global setting allows you to control whether the author box should be hidden on posts within any of the selected categories, if no other display setting overrides it. This setting overrides the ‘Default’ and ‘Hide if no bio’ global settings, but gets overridden by ‘Post’ setting explained above and by ‘Author’ setting detailed below. Display The Author Box For This Author. This setting might override any other setting explained above. This setting prevails among any other. Show. The author box will be displayed no matter what*. Hide. The author box won’t be displayed no matter what*. Default. This is the default value of this setting and, basically, has no effect on the author box display. 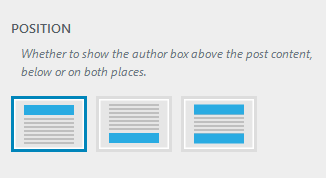 Whether the author box is displayed will be decided based on other display settings. So far we have explained how to control displaying the author box. Now that you know, let’s see how you configure where (relative to post’s content) to show it. If you want to display the author box on your sidebar, on the header, on the footer or anywhere in your site you need to make use of the provided shortcode, which is available only in the Premium version of the plugin. Yet again, this global setting can be overridden on a per post basis. So you can configure where to show the author box for each post. Default. This is the default value of this setting and, basically, has no effect. Meaning that global setting is ruling where to display the author box display. Above. The author box is displayed on the first page, above the post’s content. Below. The author box is displayed on the last page, below the post’s content. Both. The author box is displayed above the post’s content on the first page and below the post’s content on the last page.